Last year, Bank of America introduced Preferred Rewards, a loyalty program that rewards clients for having an extensive relationship with Bank of America, Merrill Edge and Merrill Lynch. This week, it launched a national ad campaign to publicize the program. Why is this interesting to credit card consumers? Because with the bonuses you earn at the highest level, it’s possible to earn 2.625% cash back on general spending or 5.25% cash back on gas–numbers that eclipse the maximum possible on other cards. 1Interest Rate Booster example: If the interest rate on a Rewards Money Market Savings account is 1.00%, a 5% rate booster would increase the interest rate to 1.05%. 2Mortgage relationship credit at closing = relationship credit at closing on a new Bank of America home purchase or refinance loan. 3Home equity benefit = interest rate discount on a new Bank of America home equity loan or home equity line of credit. 4Auto loan discount = interest rate discount on a new Bank of America auto purchase or refinance loan. While it’s clear that there are a host of benefits that Bank of America is offering as part of this program, for the purposes of this post, we’re going to focus on the credit card bonus benefit. What does it mean to have a 25%, 50% or 75% credit card bonus? This bonus represents the extra amount you will earn on top of your base rewards. For instance, if you earned $100 in base credit card rewards, a 75% bonus would give you an additional $75. Another way of thinking of it is if your card earns a 1% cash back rebate and you are in the Platinum Honors tier (75%), the card now effectively earns 1.75% cash back. It’s important to note that while most Bank of America branded consumer credit cards are eligible to receive the bonus, not all are. 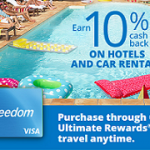 Eligible cards include the BankAmericard Cash Rewards credit card and the BankAmericard Travel Rewards credit card. Let’s take a look at what the credit card bonuses mean for these two cards in particular. The BankAmericard Cash Rewards credit card, by default, earns 2% at grocery stores and 3% on gas for the first $1,500 in combined grocery store and gas purchases each quarter. Everything else earns 1% cash back. As you can see, with the Platinum Honors bonus, the card earns a whopping 5.25% cash back on gas. 5.25% on gas, while limited to $1,500 in spending per quarter, is higher than you’ll find on any other card–all in a no-annual fee card. The BankAmericard Travel Rewards card is another card that benefits greatly from the Preferred Rewards relationship bonus. By default, it earns 1.5 points for every dollar spent on purchases. There is no annual fee and no foreign transaction fees. Book your travel however you choose, with no restrictions or blackout dates. Cover any travel-related expense including airfare, hotels, car rentals, baggage fees, upgrades and more. Cover all or part of your trip. If you don’t have enough points for an entire purchase, you can choose to use points to pay for just part of it. 2,500 points = $25 when redeemed for a Travel Credit. So, assuming you have valid travel expenses to redeem your points against, those with Platinum Honors status effectively can earn 2.625% cash back on all their purchases. If you happen to have a Fidelity American Express, you also have another good redemption option. You can choose to transfer the points you earned from the BankAmericard Travel Rewards to your Fidelity Amex account, which can then effectively be turned into cash. The highest tier of Preferred Rewards enables you to to earn cash back rebates better than you’ll find anywhere else. Are those rebates good enough reason to move assets just to qualify you for the program? Probably not, but that is a personal decision. If you have an extensive banking relationship with Bank of America already, however, it’s a no-brainer that this is a program you will definitely want to join. For more information on the program, see this link.